You have one variant associated with Neanderthal traits. Slightly more than average, I think. I - haplogrup beats any other as far as Neanderthal DNA is concerned I believe. What does yDNA have to do with Neanderthal variants? Haplogroup I is the oldest European Haplogroup therefore it inherited the most of Neanderthal DNA. R1 people who came much later inherited somewhat less. Uniparental markers and autosomal profiles are two different things. 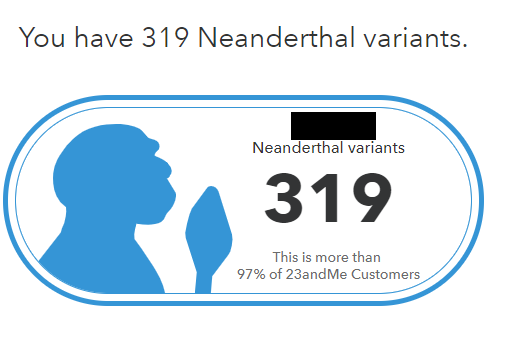 Do you know R1 guy who has more Neanderthal variants than I people? Apples and oranges. What about women who have no yDNA? I am not saying it's related to YDNA but I haplogroup being the oldest in Europe is a good indicator that one might have more Neanderthal DNA.